Al-Burhan Group is a conglomerate based in Iraq and is actively involved in major projects across the country focusing on life support and consultancy, hospitality and transportation services, equipment and machinery supply, milling, security assistance, concrete precast, concrete railway sleepers and construction projects. Al-Burhan Group’s award winning Consultancy Services has won recognition from several Iraqi Ministries for their outstanding contribution to the development of Iraq. The Group offers guidance and numerous services to expatriates coming to Iraq. The Group offers Meet & Greet Services, Accommodation, Setting up of Offices/Office Administration, Financial Guidance, Legal Assistance and other related services such as advice on how to operate in Iraq to several FTSE companies paving the way for their entry into the Iraqi market. Is a luxurious purpose built accommodation facility located at the Baghdad International Airport which houses several multinational companies. With a wide selection of single, double and VIP rooms, Al-Burhan Centre is the ideal location for the discerning traveller. It offers several features such as an airport shuttle service, 5 star dinning with international cuisine, gyms, sauna, swimming pool, tennis court, basketball court, garden cinema and lots more. Al-Burhan Airways is the only civilian Iraqi Helicopter Service. 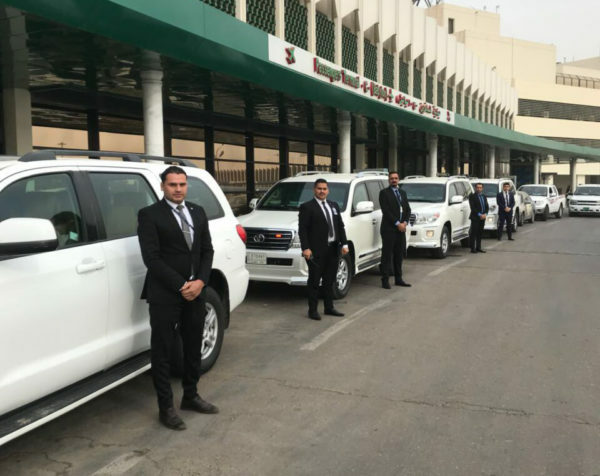 Based in Baghdad International Airport they offer; Commercial, Corporate and Private VIP helicopter flights throughout Iraq and they take pride on their technological innovations and transport efficiency. Maintaining a consistent push towards pinpointing customer needs and desires, Al-Burhan Airways provides a bespoke helicopter transportation service of the highest calibre, allowing for a timely and cost efficient means of travelling in Iraq. To learn more about Al-Burhan Airways please click here. Al-Burhan Security is licenced and regulated by the Iraqi Minister of Interior under licence number 150. With a wealth of experience of operations in Iraq for over 50 years the Al-Burhan Group is exceptionally well positioned to support businesses already established and those wishing to enter the country to join the exciting opportunities that afford themselves in Iraq. Al-Burhan has offices in Baghdad (Baghdad International Airport, Al-Mansour & Kut) and London. Al-Burhan Security has been established to further support the wider groups activities for both existing and new customers with the provision of security services ranging from Mobile Security, Static Guarding and Executive Protection. To learn more about Al-Burhan Security please click here. Al-Burhan Group offers guidance and numerous services to expatriates coming to Iraq. The Group offers Meet & Greet Services, Accommodation, Setting up of Offices/Office Administration, Financial Guidance, Legal Assistance and other related services such as how to operate in Iraq to several FTSE companies. The Al Burhan Concrete Sleeper Factory is based in Abu Ghraib Iraq and produces to the industry standard, high quality concrete sleepers which are supplied to the Iraqi Ministry of Transport. It has a capacity to produce over 2800 sleeper per day. The Concrete Precast Factory based in Kut produces structural beams, hollow core slabs and other concrete products aimed at the housing and construction industry. To learn more about Al-Burhan Concrete Precast Factory please click here. Al-Burhan Group specialise in facilitating and undergoing electricity projects in Iraq. Technopromexport having Al Burhan Group as their local partner have successfully worked on several power plant projects across the country, namely: Al-Hartha and Al-Yousifiya power stations. The Al Burhan Group Wasit Flour Mill produces flour for the whole Wasit region in the southern province of Iraq and has a daily output production of 200-250 metric tons. Al Burhan Group provide a wide range of services to the Iraqi oil & gas industry, which in turn supplies fuel all over Iraq to both the governmental and the private sector. To learn more about Al-Burhan Foundation please click here.